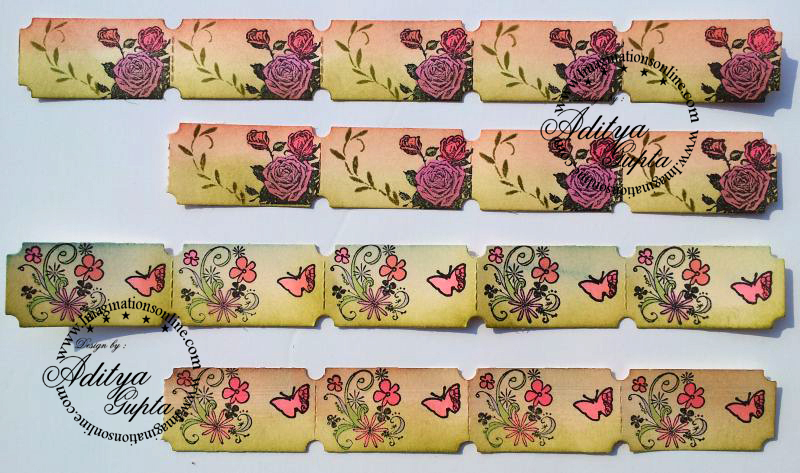 These cute little tickets were cut using Tim Holtz Ticket Die, then I stamped on them using different stamps and colored using Shinhan Touch Markers. They came out very cute. 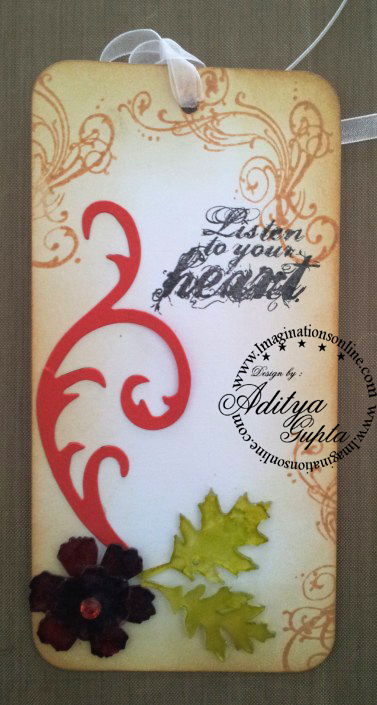 For this card, I used embossed background and some quilled flowers along with leaves. 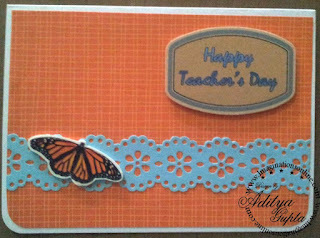 This made the whole card look very lovely and at economical pricing too. 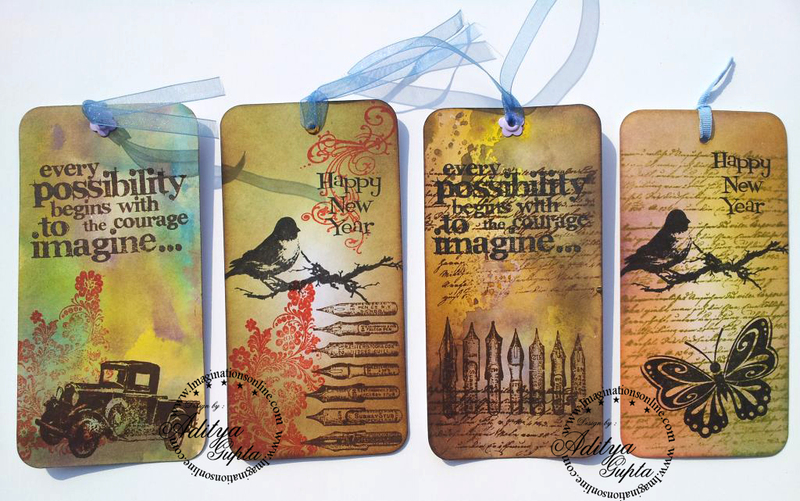 Some Tags I made using Tim Holtz Distress Ink and Tim Holtz Stamps. 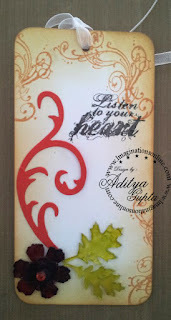 One tag which I made using clear embossing and perfect pearls. Apart from the above I have also made a lot of things which I will see if I could get pics of them. With this post I also want to mention that due to lot of work in my store I am unable to update made products on Imaginationsonline.com , however I have got plently of stock. 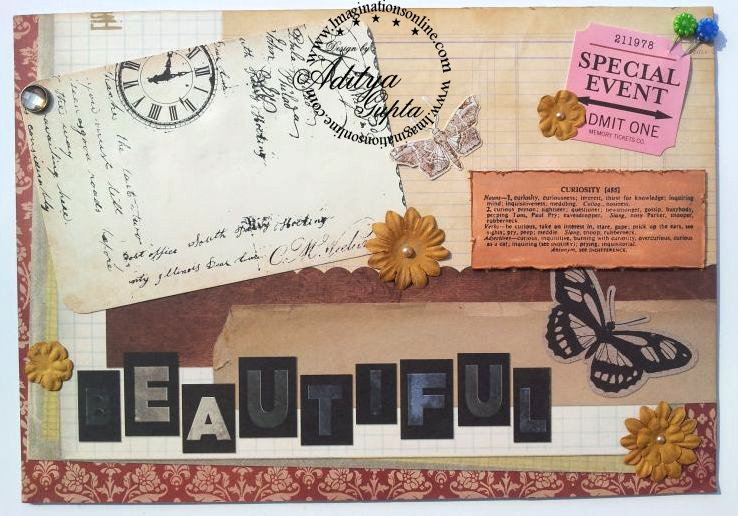 So if you find any product used in my projects and are interested then do mail me or message me. May be I have that one in stock. This will be my last post of the year. Hope the coming year bring all the joy in your life. Wishing you all a very Happy New Year. I am in love with Tim Holtz Seewing Room die, it is very useful and can be used for various projects from 3D projects to cards and scrapbooks. 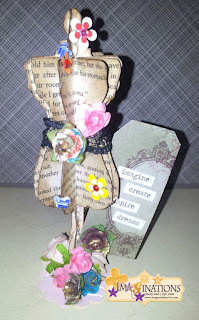 In previous post I showed you a Dressform 3D Stand , Today I will show you something I made yesterday, it is made with the help of Seewing Room die, chipboard and some papers. 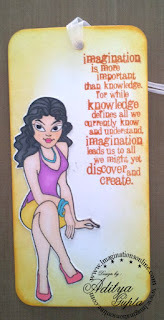 A cute Notepad which can be gifted to anyone. Decorate as per your choice, I used some ribbons to create the Dress and then used Making Memories embellishments. The words are from Tim Holtz Chit Chat Stickers Pack (They are superb and most versatile stickers I have ever found). If you make yours, then do share the link on this post. 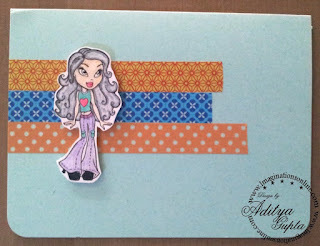 For past few days I was busy with many custom handmade invitation cards but never got time to take pics. 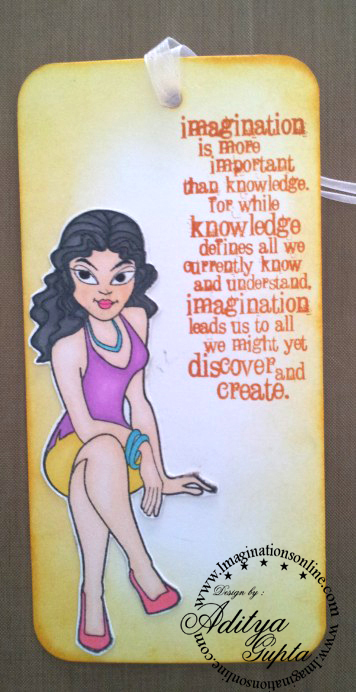 Today I was able to take pic of one of my invitation card which I made for one of my customer. It was for his daughter's Naming ceremony. 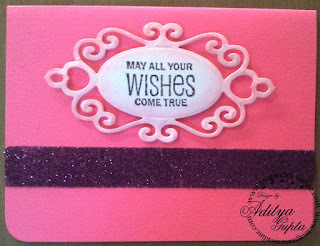 I made this card using Silhouette Cameo, I used white cardstock with embossing to bring out a lovely and elegant look. I also cut some oval shapes on which I stamped You're Invited. Isn't it cute, well I liked it very much myself and I hope you all like it too. 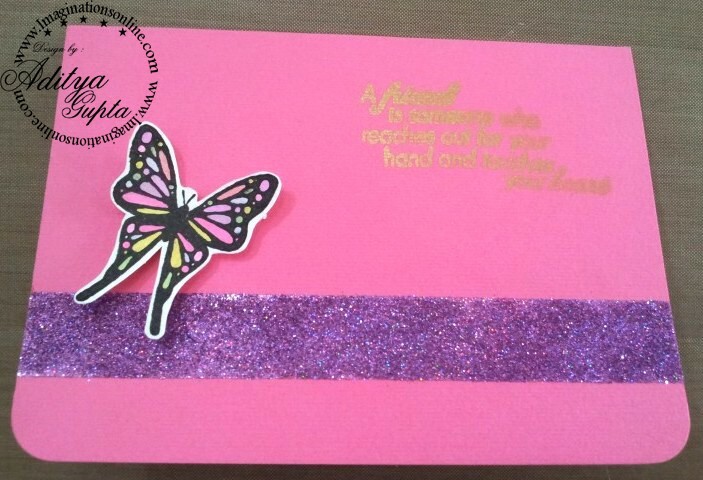 PS: During past whole month I made more than 300 custom handmade cards for different customers. I can't believe myself. First of all accept my wishes for the Dhanteras and Diwali. Now some chit chat, I wanted to share regarding my absence from blog world, updation of Imaginations website and lots more. Actually I was not absent totally but instead busy with lots of things at the same time, even as of today I have pending works which will take another 15 days to finish if I don't take any other load for next 2 weeks. At first I wanted to share the word of my Physical store which is being started 3 months back in Shahjahanpur with some cool news but now it seems I don't have enough time to figure everything, won't be able to provide any candy at this time due to lack of time. Anyway, the store which I have opened is taking a lot of effort and time. First my half day goes into college where I teach and second half goes into the shop and related affairs. I have made a lot of things in past 2 months but couldn't post because most of time they got sold instantly. Apart from this I also spent a lot of time fulfilling online orders. The only reason why I am happy is that my customers like my services. Apart from shop, online business and college I was also working on promotion of my business by putting stalls in various fairs, schools, taking workshops and also by introducing new products (which will soon be updated on the website). Recently I finished some custom card orders which included order from the DM (District Magistrate) of Shahjahanpur for her personal get together party. Even for some days I had to work till 2 am in night. But that was all fun experience. I am extremely sorry that due to all this I was unable to update my website with the new products which have arrived and can't provide you the deals which I have to offer. There are lots of new products like Tim Holtz Dies, Inkpads, Brads and more which I can offer at extremely great prices (a lot cheaper than what others may offer) but it will take some time before I could update them on website. For this project I used Tim Holtz Sewing room die, journal tag and some flowers. I also used one old book for the die cuts. It came out beautiful. I learned to make it on youtube on someone's tutorial some time back but I didn't remember it exactly. As soon as I remember her name and video link I will update it here. 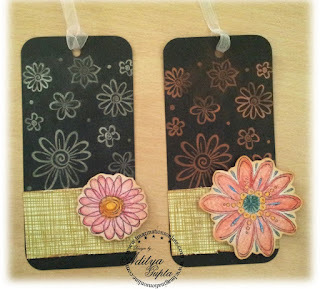 For this tag I used some variety of Tim Holtz Distress inks to blend and create a new color. 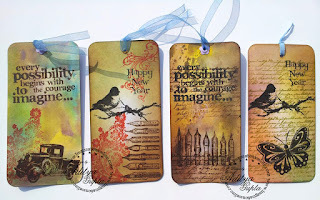 For Stamping I used Tim Holtz Stamp. 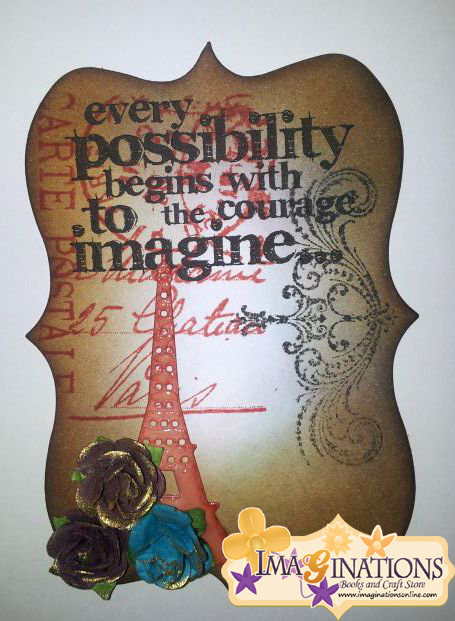 I used Prima Flowers and Eiffel Tower die of MFT. To get the cracked effect on the Eiffel Tower, I used crackel accent. 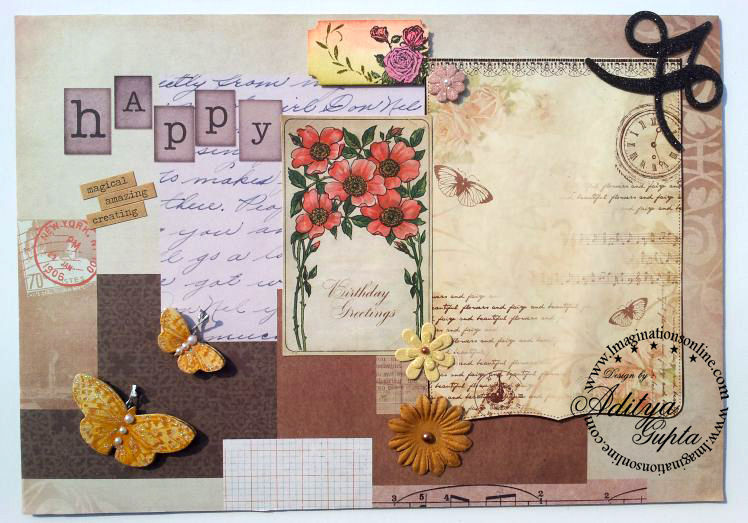 These flowers are made using Tim Holtz Tattered Flowers die and some Pattern papers from Stack 8 collection. Anyway, today I am posting to inform that over coming days you will witness some slow but drastic changes in our product lines and some new projects too. I will share them on this blog also. In the meantime I would like to share one good website who are specialized in Photobooks, Calendars and Greeting Cards. I loved their templates for the photobooks and Calendars. The only drawback I faced is that they do not have international shipping at the moment, they ship to any Address in Australia and also have express shipping option for Australia but they seems to have no options for International shipping. 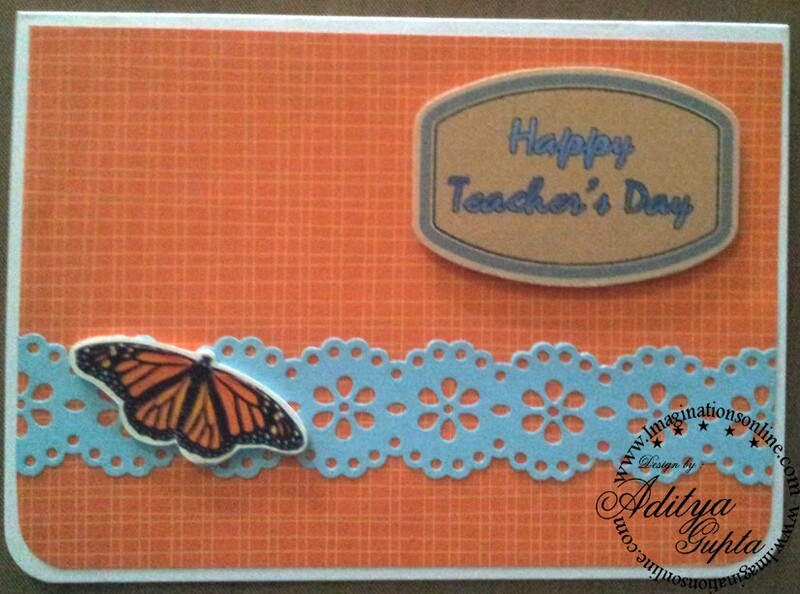 Here are some more card which I made recently. Now I am not putting any specific tags on cards as I put it on the spot whenever I need these cards. For example If I need Birthday card then I will add Birthday Tag. 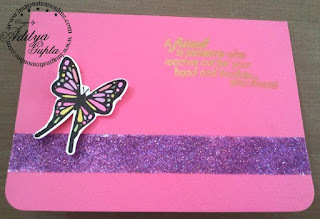 I used the double sided tape technique to add the glitter strip. I used pattern paper as back, put one tag which I printed using my printer. 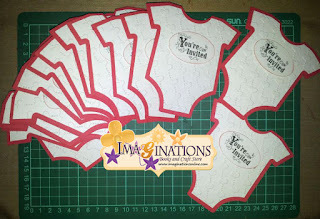 Added the punchout layer and one foam butterfly sticker (These foam stickers will be soon added on imaginationsonline.com). Nothing special but the card came out lovely. 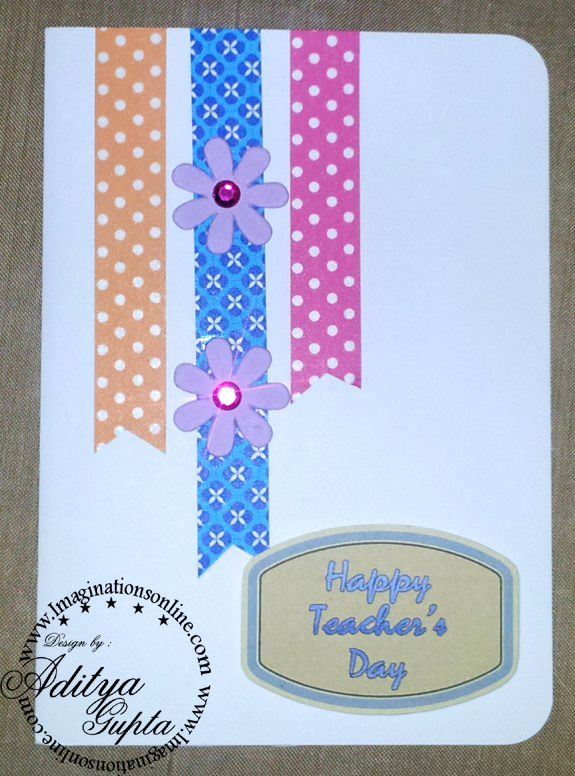 Today is Teacher's Day and hence I have created a simple card using Washi Tapes and some die cut flowers. 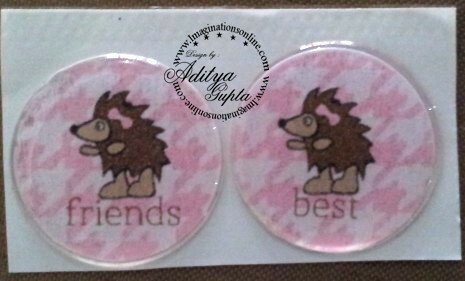 For tag I have printed and then glued it using double sided foam tape. 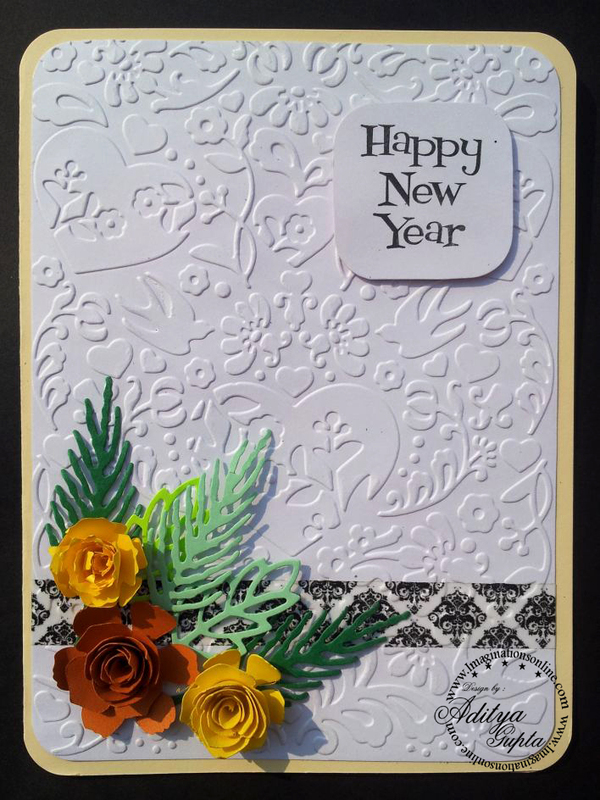 Here is a very simple card which is made using three color embossing powders, one background stamp and a sentiment stamp. Distress ink is also used to color the sentiment strip. 1. 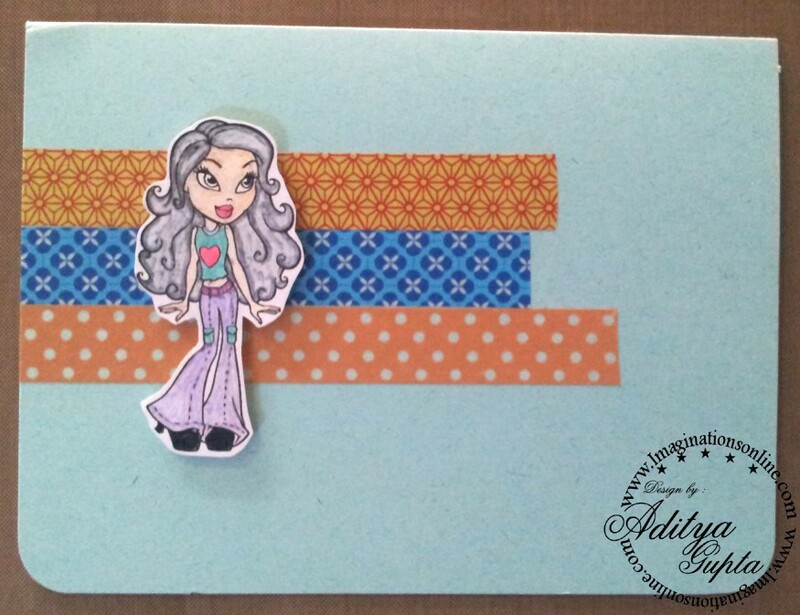 Create a base card with white color, for this card I used the dimension, 6" x 4.5"
2. 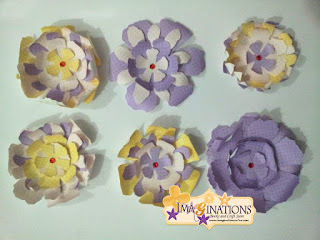 Cut 6 square blocks of 1.5" each. 3. 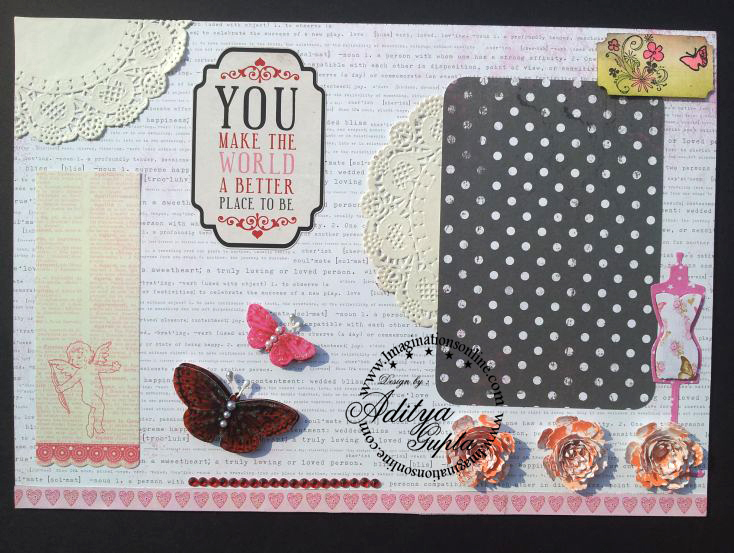 Choose your favorite background stamp, use Versamark Watermark inkpad or any other pigment inkpad to stamp on the squares. 4. 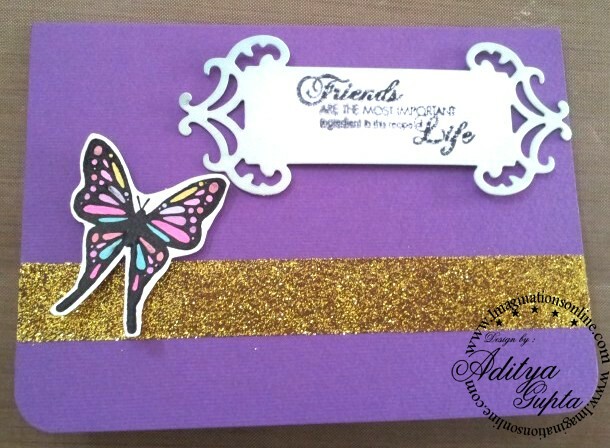 Spread the Embossing Powder on the squares, use same color for 2 squares. 5. Using Double sided Foam tape, fix all the squares on the card creating a background. 6. Add a sentiment over the squares. 7. To give some extra look on the sentiment, use distress inkpad to color the edges. The best thing for this card is that you can use any color combination of embossing powders you have, you can use any stamp and even any sentiment. 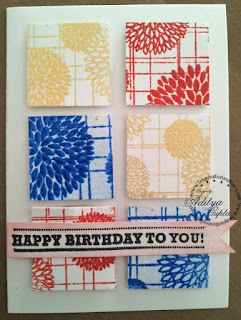 In this card I used: Hero Arts Flower Burst Pattern Background Stamp, Rich Red Embossing Powder, Blue Glass Embossing Powder, Gold Pearl Embossing Powder, Distress Inkpad - Worn Lipstick, Fiskars 4x8 Stamp Happy Birthday, and instead of Versamark Watermark inkpad I used Ranger Perfect medium inkpad (it is lot better than versamark and can also be used with pigment powders). 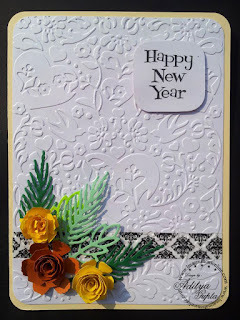 I will soon post another variation of this card as I am planning to make it today, it will be on dark color background without use of embossing powder. Lets see how it comes out. 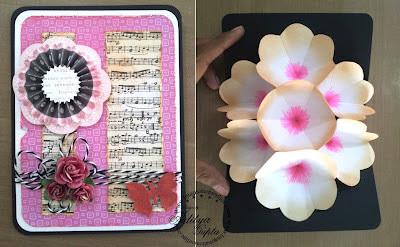 In the above card, I made pop-up Flowers for the inside. For card base I used Black Cardstock, For the internal flowers I used simple printer paper and colored them using Tim Holtz Distress Ink Pad - Tea Dye, For the cover I used Papers from Provocraft 6x12 Pack (will be added to store soon, its great value pack), The doily is a random purchase from ujjwal way back, For the Rosette I used Tim Holtz Rosette Die and added it as a layer on the doily. I used Doddle twine - Black color and some mulberry flowers. 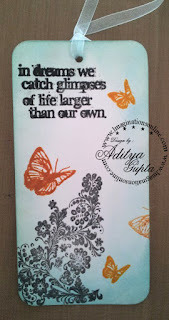 For the final decoration I used a punchout butterfly which I colored used Tim Holtz Crackle Paint - Fired Brick, I love the cracked effect of the paint. These are some random cards which I made over the past few days. All the material used in above cards are available at Imaginations, though some might not be listed in the website but its available in the store. I had saw this card some where while googling and i tried it. 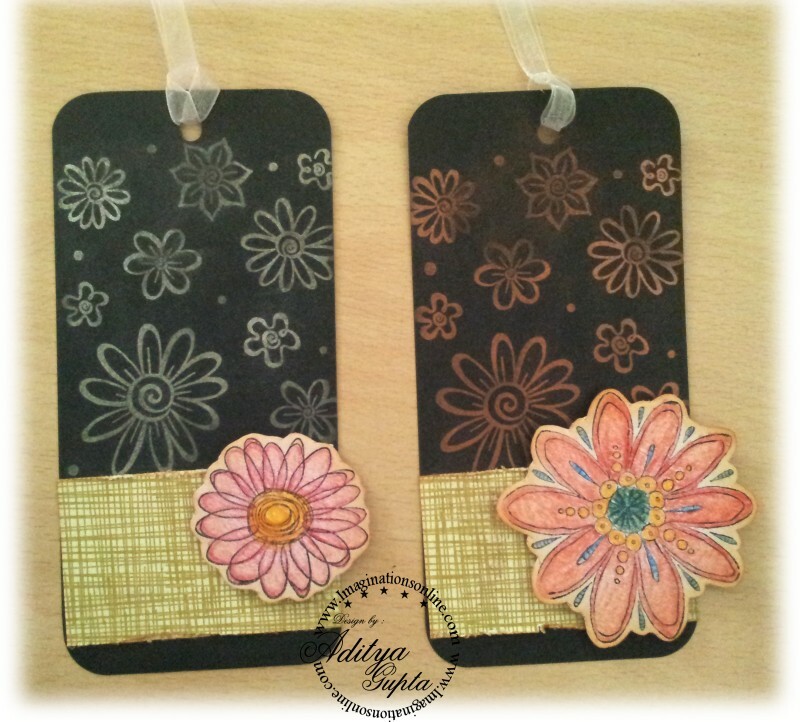 In this tag I used Tim Holtz Stamp, I also used Shrink Plastic Sheets which were die cut using Tim Holtz Tattered flowers Die and then I colored them using Tim Holtz Adirondack Alcohol Ink. These inks are superb for coloring on plastic, metal surfaces. Here once more I used Shrink Plastic Charms and Pie Lane Embellishment. 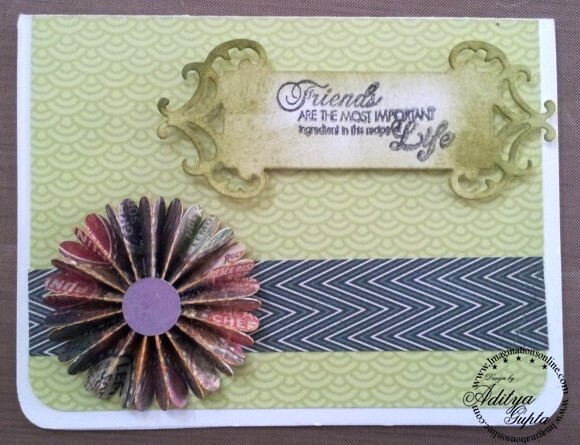 The sentiment is from Kaisercraft Friendship Stamp. For all the tags I used Tim Holtz Distress Inks for creating the background and for stamping. That is why I have decided to offer one more prize apart from the candy, a prize which any one can redeem and crafter's will surely love. 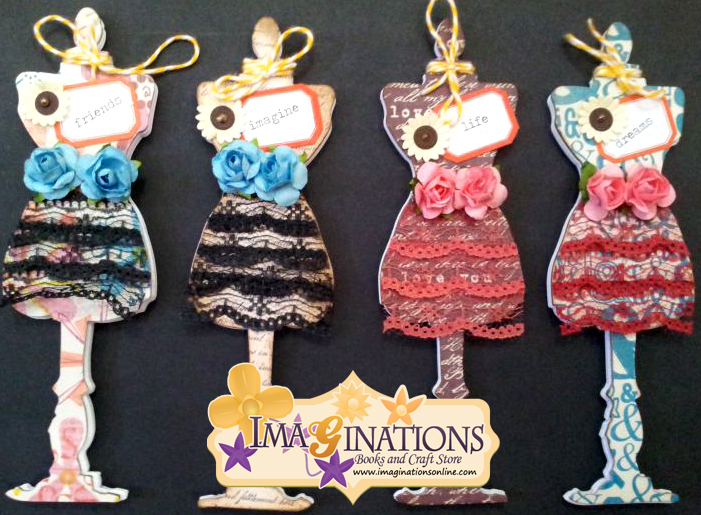 The prize is $10 gift certificate of Jessica Sprague , you must be wondering why I am offering her site's gift card. Well the reason is simple, I love her store because it is the only place from where I can purchase digital papers of Echo Park, yes Paper Packs of Echo park are available there, even dicontinued ones. and in $10 you can get around 2 full collections of Echo Park, thats great value if you have Inkjet printer at your home. You can print the papers and use on your projects, no more buying lots and lots of packs just because you liked 2-3 papers. So without troubling further with my long post, I want to present you our two winners (I have kept only those for choosing who have completed all the required task and proper entries were given to those who completed the extra requirements). Congratulations, kindly mail me your address so that I can send you the prize. Congratulations, kindly register a free account at JessicaSprague and mail me your e-mail id, I will send you the gift certificate by email which you can redeem from the site. i was quiet busy in shopping for my cousin's marriage. Also i had to host Paper Quilling Workshop at my Office which was held on 20th june and was a super duper hit. Meanwhile i was hell lot of busy in making the spl wedding card of my cousin's marriage...i was quiet nervous regarding the output...but thanks to my angel Rajni di...it came out 100 times better than i thought...this is my first Full fledged Quilling Project. Take a piece of cardstock 8 by 11 inches and score it at 4 ½ and 6 ½ inches as shown in the picture below with the longer side at the top of your score board. Turn the cardstock so that the small edge is at the top of the score board and score it at 2 and 6 inches as shown below in the picture . Now score are 2 inches and 8 ½ inches to the first score line . 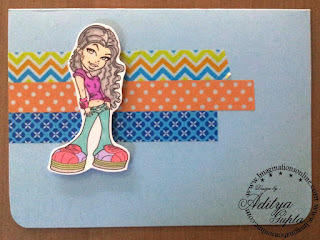 Turn the cardstock by 90 degree and repeat the step . Cut away the marked sections . You will get something like this . Now make tabs as shown below in the picture . 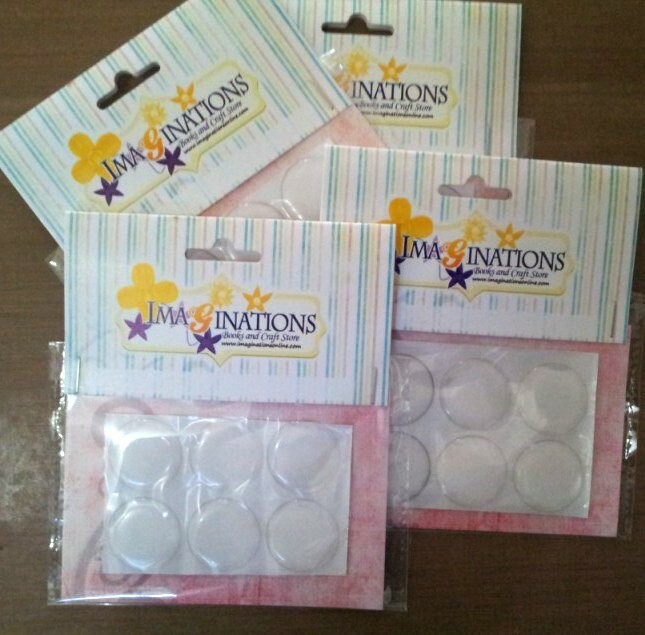 Stick the tabs to make a box like structure . 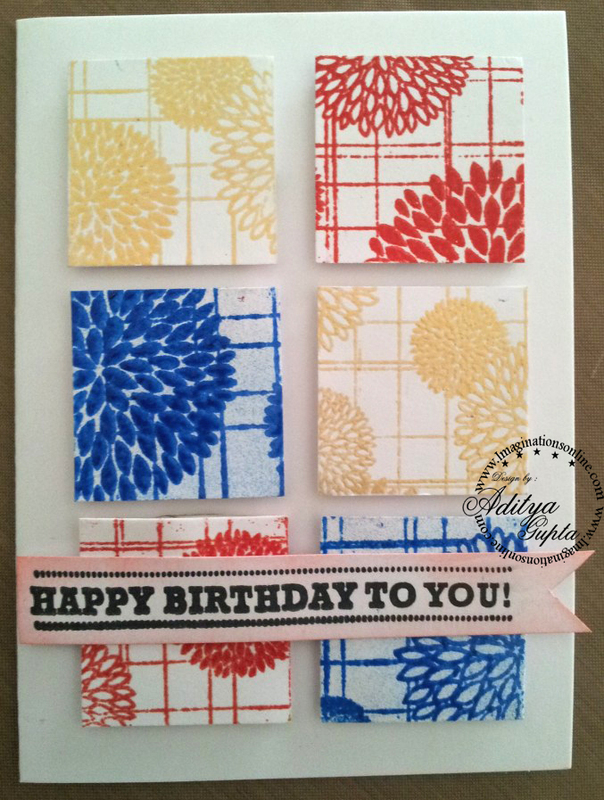 Apply patterned paper (3 ¾ by 4 ¼ inches ). Now decorate it the way you want !